Perhaps you know someone who is ready to start fresh for 2016 with a completely new and healthy outlook on life. If that’s the case – you’re in luck! We carry a variety of different healthy food gift baskets for you to help them kick off this new lifestyle with. Here are three of our favorites that we know are not only healthy but delicious, too! 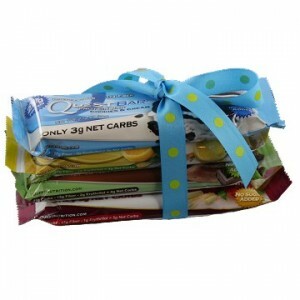 Quest Protein Bar Bouquet – Know someone who’s looking to cut the carbs in their diet without skimping on the protein? This Quest Protein Bar Bouquet is great for them! With an assortment of nine different Quest Bars in a variety of flavors to choose from, this gift is a fun and healthy way to surprise someone who’s committed to their overall health. Healthy Choice Gift Stack – Looking for something small to send that person who’s committing to a healthy lifestyle? Our Healthy Choice Gift Stack is a great option for them because it’s a small reminder to keep going and pushing them towards success. With a simple stack of four Quest Bars, you can send them a quick pick-me-up that’s not only good for them to snack on, but tasty as well. Chocolate Quest Protein Bar Bouquet – Delicious, healthy, and the fix every chocolate-lover needs, our Chocolate Quest Protein Bar Bouquet is an ideal gift to give someone who is stepping into a life of wellness. With a variety of different Quest Bar chocolate flavors, who wouldn’t love snacking on this gorgeous bouquet knowing that it’s scrumptious and good for them? Want to see the rest of our healthy food gift baskets? Visit us today at BisketBaskets.com!